The inaugral Roots & Ruts Off Road 5K benefitting Els for Autism will take place on Saturday, March 30th, 2019. Enjoy a unique off-road race through the North Jupiter Flatwoods. On the same morning, join us for a Family Fun Run (1 mile) and Post-Race Expo. 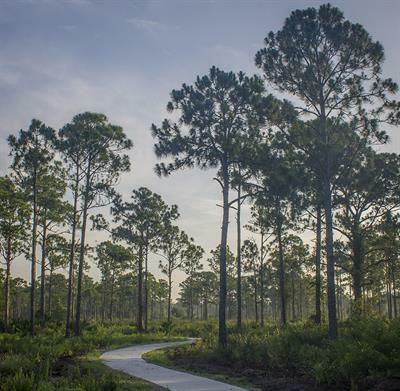 The Roots & Ruts Off Road 5K features a track through the North Jupiter Flatwoods Natural Area where you will find beautiful native habitats, including mesic flatwoods, wet flatwoods, depression marsh, and dome swamp ecosystems. Participants are recommended to be cautious and aware at all times during the race and be mindful that there are multiple ground surfaces throughout the race such as pavement, gravel, sand, and grass. Strollers and pets are not allowed on the 5K track. The race will start promptly at 8:00 a.m. at The Els Center of Excellence adjacent to the Pavilion. AccuChipUSA will provide net timing to each participant. $35 each runner| Early registration ends March 24, 2019 at 12:00 p.m.